When it comes to gifts, we have you covered. There’s something for everyone in the Waterfront District. Our Gift Certificates support local and are the most versatile way to give that special someone in your life the perfect gift. 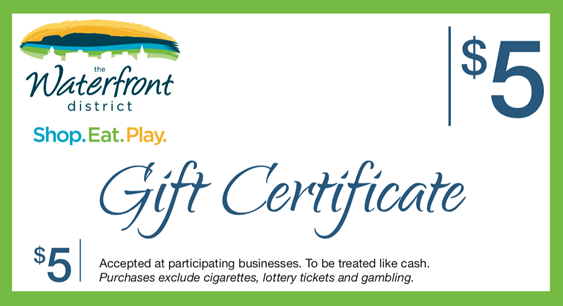 Waterfront District Gift Certificates are accepted at all participating retailers and restaurants located in our district. For a full list of businesses, visit our Business Directory. Call (807) 343 – 9032 to purchase a gift certificate today!